We left the trailhead on Saturday at about 4:30pm and made it to the Lower Saddle by 9:00pm with our HEAVY packs. Not long after we settled into our campsite I quickly fell asleep and stirred little until my alarm went off at 4:00am. We were geared up and ready to go by 5:00 and were able to find the beginning of the (very tricky) Valhalla Traverse. 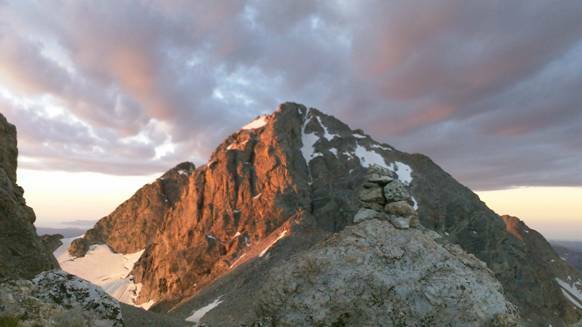 The Valhalla Traverse follows a ledge system which curves around behind The Grand Teton and ends above Valhalla Canyon and on the NW side of The Enclosure and The Grand. However, it wasn’t until 6:00am that we were able to follow the very faint climbers trail and find the cairns marking the way along the traverse. It was by far the most interesting and intense “approach” to a climb I have ever done. 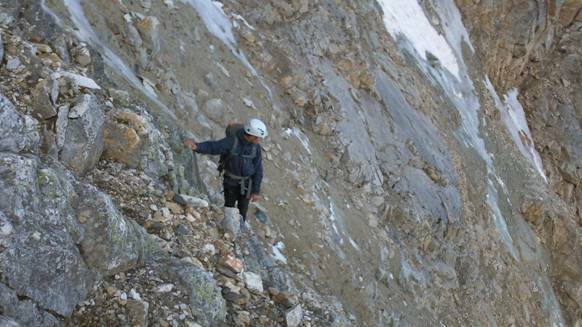 The Valhalla Traverse in and of itself is a mountaineering endeavor. 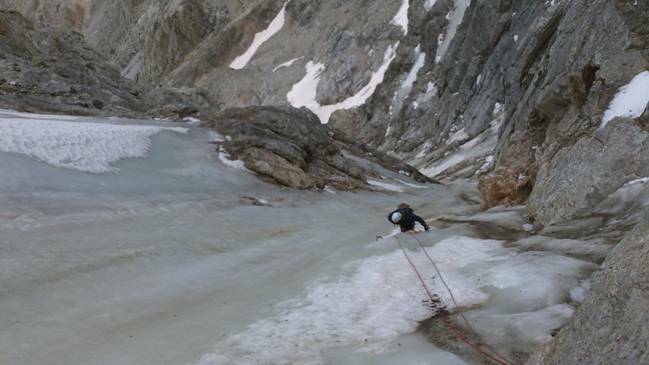 Anywho, by the time we reached The Enclosure Ice Couloir we had long since come to the conclusion that it was too late to climb the Black Ice Couloir safely and this 900 vertical foot strip of ice would be a worthy consolation prize. 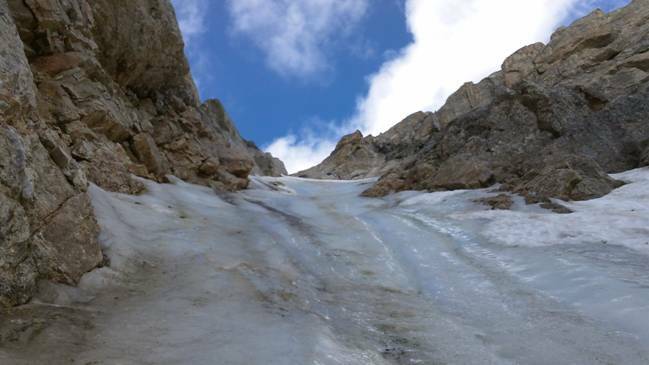 The Enclosure Ice Couloir is a Grade 4 alpine climb (Emmons Glacier on Mt. Rainier is a Grade 2) involving a difficult approach, route finding, rock climbing, and (of course) significant ice climbing. 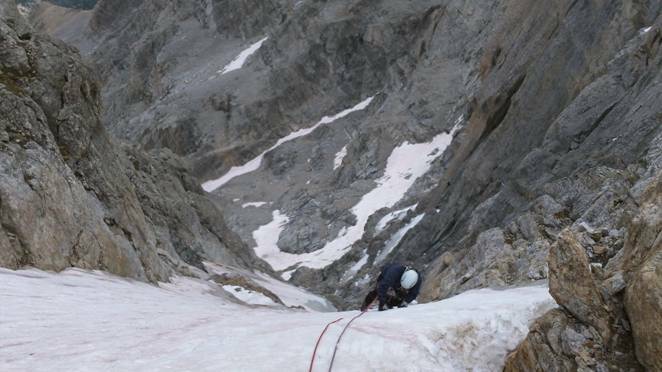 It took us 3.5 hours to climb the full 5 pitches, about 1,000ft (the last 100 feet was compact snow). I lead the 1st, 3rd, and 5th pitch of the climb. We do a leap frog type of maneuver when doing these types of ice climbs for speed and efficiency. It was magnificent climbing and it felt great to be climbing ice again (it is a hard thing to explain but there’s just something about it that is SOOO much fun). Two long rappels and some down climbing got us back to the Valhalla Traverse where we walked back to our campsite on the Lower Saddle. Both Jeremy and I were elated about climbing one of “the classics” and celebrated in our usual fashion at Dornans in the shadow of the Tetons. All and all, just another incredible day in the mountains! Hi admin, i found this post on 18 spot in google’s search results.